People who snore loudly are often the target of bad jokes and middle of the night elbow thrusts; but snoring is no laughing matter. While loud disruptive snoring is at best a social problem that may strain relationships, for many men, women and even children, loud habitual snoring may signal a potentially life threatening disorder: obstructive sleep apnea, or OSA. Snoring of this magnitude can cause several problems, including marital discord, sleep disturbances, and waking episodes sometimes caused by one's own snoring. But, snoring does not always equal OSA; sometimes it is only a social inconvenience. Still, even a social inconvenience can require treatment, and there are several options available to chronic snorers. Weight loss, as little as 10 pounds, may be enough to make a difference. Avoid alcohol, caffeine and heavy meals within two hours of bedtime. Avoid sedatives that can relax your throat muscles and increase the tendency for airway obstruction related to snoring. Change your sleeping position because you tend to snore more when sleeping on your back, sleeping on your side may be helpful. Radio Frequency (RF) of the Soft Palate uses radio waves to shrink the tissue in the throat or tongue, thereby increasing the space in the throat and making airway obstruction less likely. Over the course of several treatments the inner tissue shrinks while the outer tissue remains unharmed. Several treatments may be required. The long-term success of this procedure has not as yet been determined. Laser-Assisted Uvuloplasty (LAUP) is a surgical procedure that removes the uvula and surrounding tissue to open the airway behind the palate. This procedure is generally used to relieve snoring and can be performed in the Oral and Maxillofacial Surgeon's office with local or general anesthesia. Unlike simple snoring, obstructive sleep apnea is a potentially life-threatening condition that requires medical attention. The risks of undiagnosed OSA include heart attack, stroke, irregular heartbeat, high blood pressure, heart disease, and decreased libido. In addition, OSA causes daytime drowsiness that can result in accidents, lost productivity and interpersonal relationship problems. The symptoms may be mild, moderate, or severe. Sleep apnea is fairly common. One in five adults has at least mild sleep apnea and one in 15 adults has at least moderate sleep apnea. OSA also affects 1% to 3% of children. During sleep, the upper airway can be obstructed by excess tissue, large tonsils, and/or a large tongue. Also contributing to the problem may be the airway muscles, which relax and collapse during sleep, nasal passages, and the position of the jaw. The cessation of breathing, or "apnea," brought about by these factors initiates impulses from the brain to awaken the person just enough to restart the breathing process.This cycle repeats itself many times during the night and may result in sleep deprivation and a number of health-related problems. Sleep apnea is generally defined as the presence of more than 30 apneas during a seven hour sleep. In severe cases, periods of not breathing may last for as long as 60 to 90 seconds and may recur up to 500 times a night. If you exhibit several OSA symptoms, it's important you visit your Oral and Maxillofacial Surgeon for a complete examination and an accurate diagnosis. At your first visit, your doctor will take a medical history and perform a head and neck examination looking for problems that might contribute to sleep-related breathing problems. An interview with your bed partner or other household members about your sleeping and waking behavior may be in order. If the doctor suspects a sleep disorder, you will be referred to a sleep clinic, which will monitor your nighttime sleep patterns through a special test called polysomnography. Polysomnography will require you to sleep at the clinic overnight while a video camera monitors your sleep pattern and gathers data about the number and length of each breathing cessation or other problems that disturb your sleep. Often a "split night" study is done during which a C-PAP (continuous positive airway pressure) device is used. During polysomnography, every effort is made to limit disturbances to your sleep. Obstructive sleep apnea can be effectively treated. Depending on whether your OSA is mild, moderate, or severe, your doctor will select the treatment that is best for you. 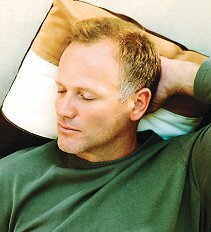 Behavior Modification - If you are diagnosed with mild sleep apnea, your doctor may suggest you employ the non-medical treatments recommended to reduce snoring: weight loss; avoiding alcohol, caffeine, and heavy meals within two hours of bedtime; no sedatives; and a change of sleeping positions. In mild cases, these practical interventions may improve or even cure snoring and sleep apnea. Oral Appliances - If you have mild to moderate sleep apnea, or are unable to use C-PAP, recent studies have shown that an oral appliance can be an effective first-line therapy. The oral appliance is a molded device that is placed in the mouth at night to hold the lower jaw and bring the tongue forward. By bringing the jaw forward, the appliance elevates the soft palate or retains the tongue to keep it from falling back in the airway and blocking breathing. Although not as effective as the continuous positive airway pressure (C-PAP) systems, oral appliances are indicated for use in patients with mild to moderate OSA who prefer oral appliances, who do not respond to C-PAP, are not appropriate candidates for C-PAP, or who fail treatment attempts with C-PAP or behavioral changes. Patients using an oral appliance should have regular follow-up office visits with their Oral and Maxillofacial Surgeon to monitor compliance, to ensure the appliance is functioning correctly and to make sure their symptoms are not worsening. C-PAP (Continuous Positive Airway Pressure) and Bi-PAP (Bi-Level) - A C-PAP device is an effective treatment for patients with moderate OSA and the first-line treatment for those diagnosed with severe sleep apnea.Through a specially fitted mask that fits over the patient's nose, the C-PAP's constant, prescribed flow of pressured air prevents the airway or throat from collapsing. In some cases a Bi-PAP device, which blows air at two different pressures, may be used. While C-PAP and Bi-PAP devices keep the throat open and prevent snoring and interruptions in breathing, they only treat your condition and do not cure it. If you stop using the C-PAP or Bi-PAP, your symptoms will return. Although C-PAP and Bi-PAP are often the first treatments of choice, they may be difficult for some patients to accept and use. If you find you are unable to use these devices, do not discontinue their use without talking to your doctor.Your Oral and Maxillofacial Surgeon can suggest other effective treatments. Uvulopalatopharyngoplasty (UPPP) - If the airway collapses at the soft palate, a UPPP may be helpful. UPPP is usually performed on patients who are unable to tolerate the C-PAP. The UPPP procedure shortens and stiffens the soft palate by partially removing the uvula and reducing the edge of the soft palate. Hyoid Suspension - If collapse occurs at the tongue base, a hyoid suspension may be indicated. The hyoid bone is a U-shaped bone in the neck located above the level of the thyroid cartilage (Adam's apple) that has attachments to the muscles of the tongue as well as other muscles and soft tissues around the throat.The procedure secures the hyoid bone to the thyroid cartilage and helps to stabilize this region of the airway. Genioglossus Advancement (GGA) - GGA was developed specifically to treat obstructive sleep apnea, and is designed to open the upper breathing passage. The procedure tightens the front tongue tendon; thereby, reducing the degree of tongue displacement into the throat. This operation is often performed in tandem with at least one other procedure such as the UPPP or hyoid suspension. Maxillomandibular Advancement (MMA) - MMA is a procedure that surgically moves the upper and lower jaws forward. As the bones are surgically advanced, the soft tissues of the tongue and palate are also moved forward, again opening the upper airway. For some individuals, the MMA is the only technique that can create the necessary air passageway to resolve their OSA condition. Sleep apnea is a serious condition and individuals with OSA may not be aware they have a problem. If someone close to you has spoken of your loud snoring and has noticed that you often wake up abruptly, gasping for air, you should consult your Oral and Maxillofacial Surgeon.